Top Run is endless runner with platformer elements. Play as Kevin and his dog Buddy and make your way through the neon city full of dangerous enemies. • Use superpowers to survive epic battles while you run! • Collect pixels to upgrade your abilities and gain more power! • Cloud saving - continue playing on any device you sign in to! • Free and offline! So no WiFi needed! It has everything we love: neon, pixel art, a bit of outrun, tiny piece of synthwave, scanlines, VHS effects. What else anyone would want in a retro arcade game? If you love 1980s then you definitely love good music. We’ve got professional soundtrack for you from a great synthwave artist - Beckett. That’s why we recommend you play with headphones to have a fully immersive experience. Friends: save your friends Joy, Darryl and Ben and they will help you on your dangerous journey. Just shake your phone to use their super powers. Rage mode: what others call zen we call rage, let your inner anger out! 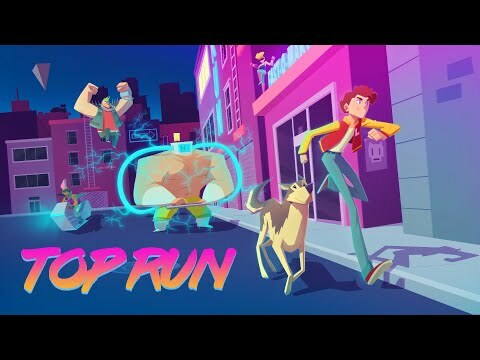 Top Run was developed by a family of two people who adores 80s and wanted to create a fun game for adults who are nostalgic about 1980s and a game for kids who love addictive and challenging action. The game is free with ads, there is no way someone can pay to win in this game, everything is completely fair. If you’d like to support us, you can buy a full game that will unlock everything for you and give you additional playable retro pixel arcade! A game within a game! Yay! If you enjoyed Top Run please rate it and leave an honest review. • Default permission required for Unity3D Engine. - Cloud saving is back: be sure to sign in with your Play Games account. Attention! Cloud saving is disabled in this release to avoid resets of game progress. It would be enabled in future releases after we fix it. We highly recommend you not to delete the game at this time if you don't want to lose progress.